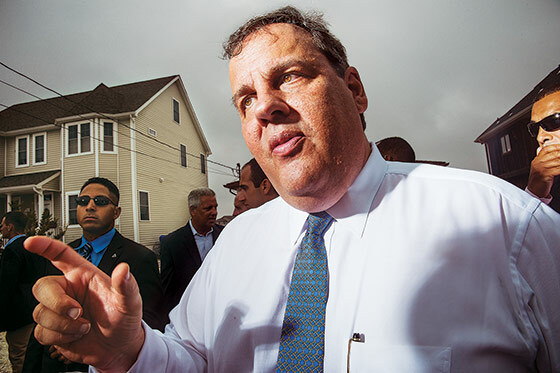 In New Jersey, charisma is a blunt instrument. Even in its most lyrical incarnations—in Philip Roth’s perception, or Bruce Springsteen’s—the state is the site of a fevered, haywire sexuality, a place where all of the most full-blooded human instincts run loose: aggression and vanity; a big hearted, desperate romantic yearning; a carnal materialism. This is the metaphorical Jersey identity, and not too long ago it claimed at most a portion of the actual political state, if any. My wife grew up in the nineties in a lakeside town in Sussex County, a place so culturally distant from the sulfurous refineries near Elizabeth that it possessed its own municipal water-skiing team, and when her classmates at college would make fun of New Jersey, she genuinely did not know what they were talking about. But since then, the metaphorical Jersey has spread, diffused through television dramas and reality shows, and now the whole state exists in some relation to it. We used to talk about New Jersey as if it were a cultural appendage to New York and Philadelphia, as if it were someone’s anxious cousin. This self-consciousness still exists, but no one would mistake New Jersey, anymore, for anything but itself. News of this sort can sometimes take irritatingly long to breach politics, but New Jersey finally has a governor equal to itself. Very swiftly, just over three years after his election, the emotive, combative Republican Chris Christie has come not just to personify the vivid strangeness of politics in this place but has also become arguably the most popular politician in the country and a rare figure of bipartisan interest in a party that has been led by its most fervent ideologues. By this summer—the summer of the death of James Gandolfini (and therefore, definitively, of Tony Soprano)—Christie’s identity has so fully merged with that of New Jersey that he has been able to defend his frequent national media appearances by saying that when his own pugnacious face is on television, it presents the best possible public image of the state. Part of the intense affinity between Christie and his state is owed simply to his rare capacities as a politician, the precision of his cultural ventriloquism. To take one example: In his first year as governor, Christie decided that he wanted to kill a project called the ARC tunnel, which was set to be the capstone of the liberal senator Frank Lautenberg’s long career. The project included two commuter-train tunnels under the Hudson with a surfacing station near Herald Square—it was to be a little foothold in the city for New ­Jerseyans alone. But the ARC tunnel was an expensive project, and Christie had other priorities. So he started referring to the project as “the tunnel to the basement of Macy’s,” a line he’d picked up from a local environmentalist. The phrase came to define the project. In retrospect, it was engineered almost perfectly to leverage the way people in North Jersey view New York City: It captures the feeling of being a second-class citizen, the sense that New Jerseyans in the city are wanted only for the money they spend, that they are subject to the most hectic and disorienting experience of New York and should be denied the dignity of sunlight. Within ten months, the tunnel project was dead. “He killed us with that phrase,” one of the ARC tunnel’s chief proponents told me mournfully. And all of this in the space of seven words, two of which were prepositions. Politics, everywhere, is a consequence of geography, but with Christie the effect is more pronounced than with most. New Jersey is a very specific place, with its desolate cities and fortified suburbs and an extreme economic privilege that is both widespread and barely acknowledged. Christie holds conventionally conservative positions on many issues—he’s against gay marriage, pro-life, opposed to government programs for the poor and supportive of cutting taxes on businesses and the rich—and can voice anti-elitist grievances as sharply as any leader on the right. But his anger is directed at different targets and serves a different politics—more cosmopolitan, less alienated, less stringently individualistic; he offers an alternate idea of what conservatism might have looked like during the Obama years, had it been fed by the frustrations of the suburban middle class rather than those of the suspicious, disempowered fringe. With characteristic humility, Christie has spent his summer on the campaign trail offering himself, and his state, as a national ideal. Politicians, generally speaking, have a problem: “It is hard to communicate,” as State Senator Joe Kyrillos, Christie’s ally, puts it. It is not so hard for the governor. Christie has a genius for combative clarity; Trenton, in his mouth, is a theater of grotesques, of corrupt and deluded and self-interested politicians, enemies of progress. He has a tendency to become so overwrought (“Can you guys please take the bat out on her?” he once groused to reporters, about a state senator named Loretta Weinberg, then a 76-year-old widow) that the aggression has become an event in itself. Christie’s lap-band surgery may have made him healthier, but it has not discernibly altered his physical appearance; he still looks like a bully, still deploys menace as if it were a form of seduction. His crowds come, in part, for the cartoonish pleasure of watching a grown man blow a gasket. But Christie is cannier than that. He is not unmanageably angry so much as he is a mechanism for managing anger, for channeling it and dispersing it tactically. “Here’s a guy who, on this issue, his principles are like that flag that blows around in the wind, okay?” Christie said. “It makes me laugh, it’s absolutely ridiculous.” Christie went on, “I mean, if there’s anything that is more indicative of a lack of principle on an issue—you don’t vote yes or no? What’s that, maybe?” There are moments in Christie speeches when a logical line has ended but you get the sense that the energy has not yet dissipated, in himself or in the crowd, and that whoever speaks next will be a target. In this instance, it was a reporter who wanted to ask a follow-up question. Christie turned to him: “That’s my answer. So if you don’t like it, go ask someone else.” It took six Springsteen songs before the crowd let him leave. Community has a particular political meaning here. The state has 565 municipalities, most of them small enough to sustain the illusion of classlessness. This proliferation of tiny fiefdoms—distinct, politically isolated—is a quirk of the state’s political history and is kept in place by its system of taxation. New Jersey’s state income tax is the lowest of the 43 states that have an income tax, and its local property taxes are the highest in the nation. (One consequence is that the state taxes fall more heavily on the rich and the local taxes on the lower middle class, and so as Christie has vetoed attempts to reinstate a millionaire’s tax, cut business taxes, and severely diminished a program for property-tax relief, he has shifted the tax burden downward.) The promise of this system is that resources can be kept close to home, where they will be plentiful, and used to build little utopias, and often this has actually happened: The state is filled with superlative school systems. The heart of New Jersey, yes, but also the scene of its greatest racial brutalities and the source, thereafter, of its deepest feelings of regret. In many prosperous North Jersey towns, you will still find first-generation migrants from Newark, some who shun what the city has become, some who express guilt at its abandonment. Christie’s own working-class parents left Newark in 1967, borrowing money from his two grandmothers to make a down payment on a house in Livingston, which was then on its way to becoming a rich suburb. This was also the year of the ­Newark riots, which means the Christies were part of one of the greatest episodes of white flight in American history. For Christie, Newark is always both a nostalgia and an aspiration tour, a way to stress what the city has in common with the rest of the state rather than what keeps it from catching up. “If he were really concerned about Newark, he’d be like [former Republican governor] Tom Kean. He’d spend his time in the South Ward, the Central, the West Ward, where the minorities live and where there is gangbanging, and he would address the criminal-justice problem,” says Newark state senator ­Ronald L. Rice. “He just does not do it. He doesn’t care.” But Christie does not need to convince suburbanites, as Kean did, that the inner city is a controllable problem, that the watch stations and barracks are in place. What he needs from Newark is something more modern, something that explains his intense connection with Booker: He needs to be able to prove to a more liberal state that a historical loop has been closed and that his own anger can become a politics of hope. Harlan Coben, the best-selling thriller writer, was 9 years old, another Newark refugee in Livingston, when he met Christie on a Little League field, the future governor a chunky kid in a catcher’s get-up coming toward him, saying his full name: Harlan Coben—Hi, I’m Chris Christie. “What 9-year-old does that?” Coben said to me 42 years later. New Jersey then was barely the Jersey we know now, but by the time Christie was a teenager and a Bruce Springsteen fan of extreme emotion and attachment, the persona of the state was beginning to take hold. Christie shares Springsteen’s Everyman persona, but Coben told me he thought there was another commonality, that each understood the power of the Jersey identity, “that to be something specific was to be something universal.” For a musician, this means a way to envelop a listener in the drama of his song. For a politician, it can mean an answer to the most basic question voters ask: What are you in this for beyond yourself? There is a video available online of an incident on the boardwalk in Seaside Heights last July that—depending upon your view of the governor—is either comic or obscene. It is nighttime, and Christie is eating an ice-cream cone when a heckler walks past and says something to the governor about his war on the school system. At which point the governor, furious, charges down the boardwalk after his antagonist, ice-cream cone in hand, at first baiting the man, then taunting him. “You’re a real big shot, you’re a real big shot shooting your mouth off,” the governor yells, as the heckler eludes him—not all that difficult, given Christie’s sheer mass and the presence of the ice-cream cone. “Keep walking away,” the governor calls after him. “Really good. Keep walking.” It is possible to interpret this as just more bullying, which is how some of the state’s newspaper editorialists took it. But it is also the response of a man for whom argument is the ultimate form of human contact. 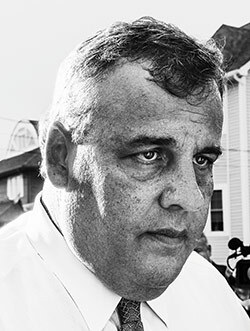 Christie is a small-craft warning of a human being; he is a rush of blood to the head; he is a bully. But the governor is something else, too, something that ­separates him from the nihilistic elements of his party and—maybe—gives him a chance to lead them. He is a believer.